Oaks Park is a small amusement park located 3.5 miles south of downtown Portland, Oregon USA, near the Sellwood Bridge. The 44-acre (18 ha) park includes midway games, about 2 dozen rides that operate seasonally, a beautiful skating rink that is open all-year, and picnic grounds. Oaks Amusement Park has been the fun, safe, and affordable way for families to enjoy and have a relaxing day out for 101 years! Thrill rides, kiddy rides, roller skating, and tons of riverfront picnic spaces make Oaks Park Portland's premier place for family fun. Perfect location for any group from birthday parties to corporate events. 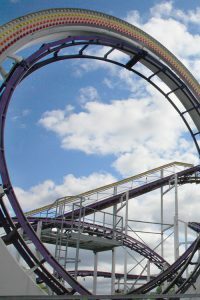 Other Specials & Coupons To view Oaks Amusement Park Discounts, other Specials and Coupons, go to their special page by clicking here. Oaks Amusement Park updates this page throughout the year, so check back to see if new specials and coupons have come in. Note to our visitors Oaks Amusement Park coupons and specials can change without notice. So please visit their official website to make sure of the latest pricing and coupons.